Music:Leeds is a new development body for the region, a not-for-profit organisation functioning as a single, centralised contact point. Supporting Leeds as a world-class city for culture, Music:Leeds will contribute to the city’s identity as a music hub, boost its international profile and attract visitors. The organisation will coordinate music-based activity in the Leeds music sector, whatever the level, genre or pathway. Music:Leeds represents an opportunity for Leodians from all walks of life to access and engage with music. Providing a new level of support for those invested in the Leeds music scene through commercial and community pathways, Music:Leeds will create networking opportunities, targeted projects, music events, advice for individuals, local organisations and businesses, and provide funding from national funders and music industry bodies. Music:Leeds will host the first of a series of City Music Forums on Tuesday 5th March at Leeds Town Hall, in coordination with Leeds City Council Arts, Venues and Events. offering feedback on important issues impacting the role and profile of music in the city. Attendees will be invited to propose items for discussion on the day. This event follows a successful Town Hall event in November 2017 which attracted speakers from across Europe. Music:Leeds hopes to continue the branding of Leeds as an attractive city for young creatives, nurturing an environment which encourages graduates and those who have studied in the city settle here. This in turn provides economic and social benefits, further enriching Leeds’ cultural and creative industries to the benefit of the city for years to come. Partner organisations collaborating on the artist platform Launchpad include: Leeds International Festival, Black Music Festival, JazzLeeds, Live At Leeds, Inner City Electronic, MAP Charity, Come Play With Me, Studio 12, DJ School UK, Chapel FM, World on our Doorstep, Sound and Music, Cloth Cat, South Asian Arts, Leeds Music Trust, Urban Development, Kycker, and Yorkshire Music Forum. Music:Leeds is supported by Leeds 2023 & Leeds City Council, with public funding from the National Lottery through Arts Council England and additional support from UK Music, PRS Foundation, Leeds Beckett University, Leeds College of Music, Leeds BID and Awesome Merchandise. Throughout 2019, Music:Leeds will be undertaking a number of projects to help support and grow music in the city, addressing inclusivity through Gender Equality initiatives and improving awareness of venue accessibility with partners Brighter Sound and Attitude is Everything . A report based on the organisation's 2017-2018 mapping exercise will follow later in the year, alongside a new website, designed in collaboration with Leeds Inspired. These will improve signposting to all opportunities and music-related activity across the region. “Music:Leeds is an important milestone as the city gears up for our international cultural festival in 2023. Music is woven deep into the fabric of Leeds. It’s home to a strong, diverse and innovative music industry. By connecting and collaborating across genres, art forms and sectors, Music:Leeds will see engagement across all our communities so that local talent flourishes and our citizens can access a world-class cultural offer. We look forward to continuing to nurture, celebrate and showcase world-class talent on the international stage”. “The establishment of Music:Leeds is an important step in promoting Leeds as a city of creators; a city which welcomes and nourishes talent and provides the necessary environment to learn, grow and develop in our thriving cultural and creative sector. Music:Leeds has a real opportunity to capitalise on the talent and potential in the city to not only contribute to the city’s cultural narrative, identity and profile but to also ensure that Leeds is the best city in which to live, work, visit, play and create for years to come”. “Music makes a huge contribution to our culture and our economy. This brilliant initiative will be a great way of showcasing and strengthening the city’s vibrant and diverse music scene. “Leeds has been our home since our inception and has provided us with the roots we needed to thrive as a small business. We have been embedded in the vibrant local music & arts scene for over 13 years. Collaborating with artists, venues & organisations in Leeds has helped us build our company to a global level; we now export around 10% of our orders and have set up a new factory in the US, all underpinned by our 100-strong team in the UK, a huge proportion of which have come from the creative scene in the city. 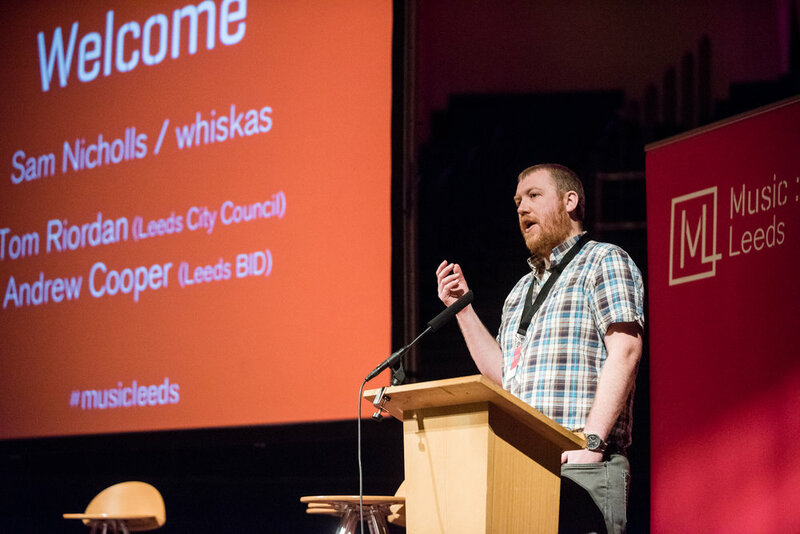 "We think the future for music in our city is collaborative, and Leeds College of Music is delighted to be part of this initiative, which builds on the powerful momentum and sense of community that has been a hallmark of our involvement with previous Music:Leeds events such as The Unconference. This activity, and the support that derives from them means a great deal to our students and provides them with a powerful insight into the industry that awaits them on graduation. Leeds College of Music Looks forward to a long and fruitful association with Music:Leeds."